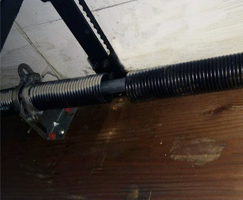 Make sure that you test the balance of the entire installation in order to prevent a garage door off track. This also helps reduce the incidence of avoidable accidents. Disengage the opener using the release handle. This will vary depending on the instructions that were given by the manufacturer. Lower the door until it is about halfway the distance that it would normally travel. Under normal circumstances, the garage door should be able to hold that position without assistance. If not then it could be that the door is off track or one of the cables is hanging loose. On the other hand if the door tends to ride up then it is the springs that are under a lot of tension. Before replacing any part make sure that it is fit for purpose. If there are any signs of damage then that part should be replaced first before getting the garage door back on track again.